I am trying to figure out why people need online markets and "tastemakers" to tell them what things to like- as opposed to their brain, mind, heart... things of that nature. It's one of those questions with an obvious answer I don't like...or I won't ever understand it correctly in my head to the point of sounding like an idiot on this blog. Naturally the latter. I pronounced the "o" softly like "oh" when I read "idiot" in that last sentence. I've drank a lot of sugar this morning. I went to Shawnee had my painting class at the bakery and only one person did not like it, because I mentioned copying other living artist's work off of the internet is kind of a copyright infringement issue (and it turned out my saying that made them feel "called out" because they had their iPad out tucked behind their purse, open to Pinterest and were doing just that! ), but I thanked them anyway for attending. I have had plenty of people tell me the difference between "response" and "reaction" and working with leaders who have had to compromise with businesses and very official agencies, (in a state with diverse politics trying to accept the arts!) I think this was one of those opportunities for the bakery to give service to both its customers and its vendors as well, because business relationships are multi-faceted, but that fell by the wayside and it is both disappointing and ironic. I am looking at a majority of happy people and one person who was never going to be pleased EVER as a personal win- because I used to be one of those chronic never-be-happy-people, there is just no pleasing some! OKC and Edmond with instructors I know! I did receive some glowing comment cards from everyone else that made me smile. I also had the opportunity to talk to a local photographer who attended who is an AMAZING painter about the new arts district sprouting up downtown, and about OVAC. The best way I can respond to a lousy situation- and I have met with PLENTY of those in my hometown- is to make more ART! I did renew my OVAC membership and gave my studio a sparkling clean.... If you paint regularly and want more legitimate art workshops and opportunitiesm the Oklahoma Visual Arts Coalition is what you need to investigate! The Artist Survival Kit workshops for art business, photographing work, and getting featured by those who write about art are coming up soon!! 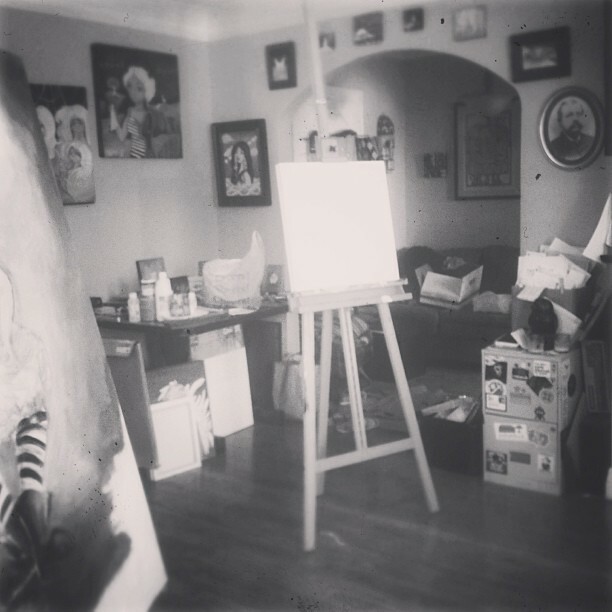 there's a painting started on that smaller easel but you can't see it because of the filter! During the interim I left some tea in the tub to stain on some paper... To stain your own paper it's super-simple, just prepare like you are going to drink a whole LOT OF IT and loose leaves will stain darker or add texture. I have made a step-by-step tutorial at this link. And I couldn't resist after it dried and made a little teensy gouache girlie on it! For more pics of the Paint-n-Sip session from last week at the bakery in Shawnee, check out my Google Plus Albums, where I will be keeping them together and adding my past classes and parties in a nice neat location. I will also be adding them to my Facebook Page after Labor Day. Everyone be safe this holiday! !